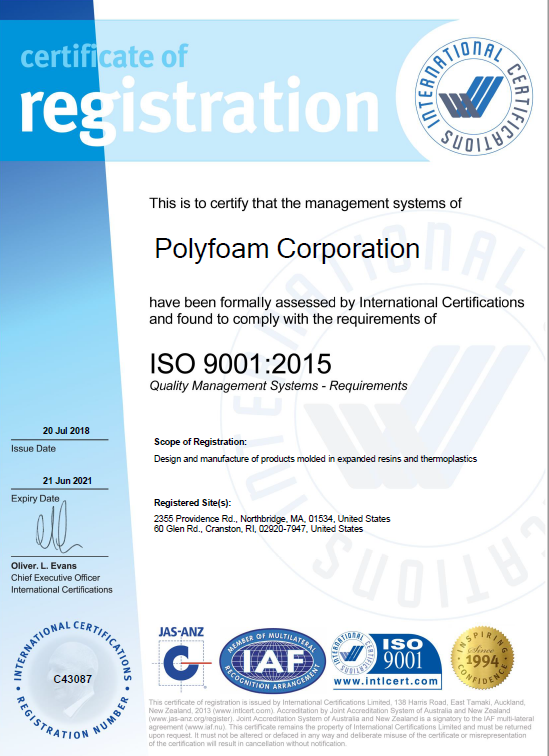 Polyfoam Corporation is a registered ISO 9001 company. ISO requires the establishment of measurable quality goals. Polyfoam’s main goals are continuous improvement of our products and services, and reduction of scrap. The ultimate effect is improved internal efficiency, which allows us to provide more competitive pricing and better services than other molders. 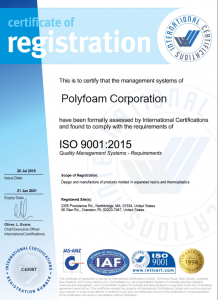 ISO 9001 means that a company’s products are manufactured under a quality system that conforms to ISO requirements. ISO is not a substitute for mandated product testing or certification. Past experience has indicated that registered companies have more consistent quality and a lower “cost of quality”.